Times were different before I became a mother. My schedules and activities are now bound by my baby’s feed and nap times. Infact, I have now learned the value of time and time management much more post baby. Gone are the days when we just hopped into the car, went for long drives and then decided where to eat lunch or dinner. If we were running late, we invariably landed at one of our favourite 24 hour restaurants where I ordered grilled paneer cheese in skewers that were served with a tomato marinade, dip and a small salad. This is a typical restaurant style dish that you could serve at home for lunch, brunch or maybe even dinner. Add some bread and you have a complete and fulfilling meal bursting with fresh colours, varied textures and gorgeous flavours. The number of dishes with paneer on divinetaste does not do justice to my great love for paneer. So, allow me to kickstart showcasing one of my favourite foods with this post. 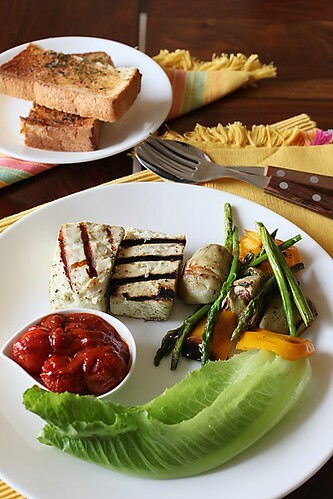 Paneer is simply spiced and grilled becoming the perfect partner to the other dishes on this platter. I love roasting vegetables on my grill as well as in my oven. The asparagus, artichoke and bell peppers taste wonderful when roasted giving out deep flavours. The best part of this salad is in the dressing which further highlights the taste of the vegetables, the secret ingredient being pomegranate molasses. I have literally fallen in love with this product from Lebanon and use it wherever I would have to use balsamic vinegar. 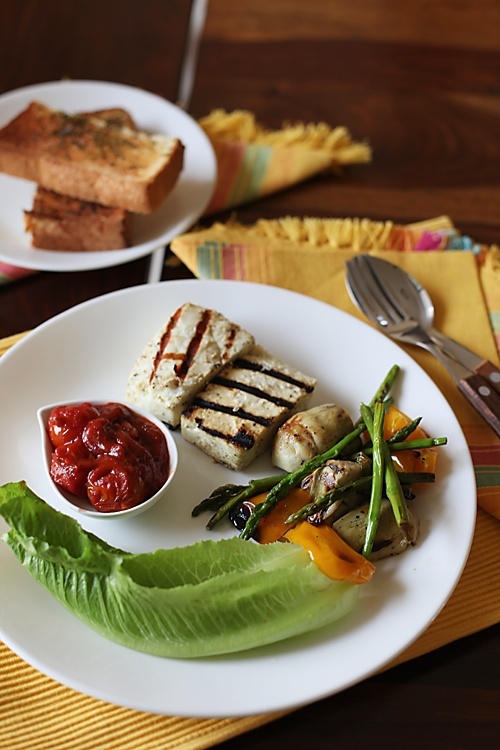 The tart, sweet and hot cherry tomato fondue tastes great with the grilled paneer. It could also be a dip with crudites, pita chips, a vegetable platter or served with sandwiches. You know what goes best with a meal like this? Warm buttered and herbed toasts! 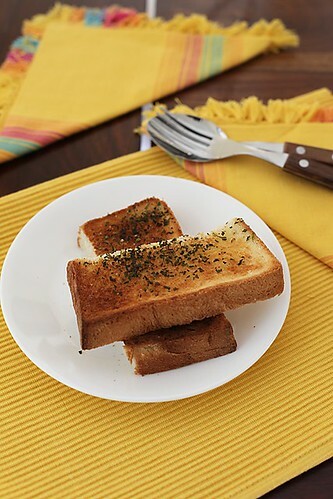 I love to brush melted butter or ghee over store bought or homemade bread, sprinkle it with salt and herbs like oregano and parsely and grill it in the oven until it turns golden brown and crisp on the top and yet maintains its softness beneath. Bound by our little angel’s schedules we now take comfort in meals like this until a time will arrive when the long drives and meals at far away places becomes a part of life again. This is a complete meal on a platter bursting with fresh flavours, colours and textures. Pomegranate molasses adds that extra zing to the salad. Serve with herbed, buttered and toasted bread and Romaine lettuce for a fun and elegant brunch, lunch or even dinner. 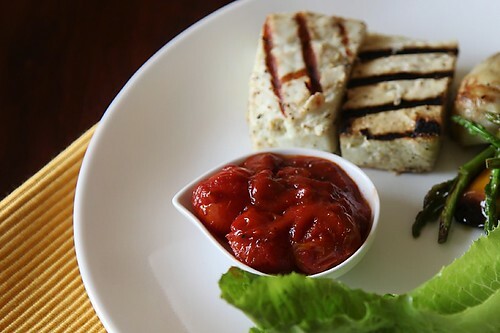 Cut the paneer cheese into big chunks of squares (around 3” or 8 cm) or rectangles. In a small bowl, mix in the olive oil, asafetida and salt. Brush the paneer pieces with the prepared olive oil. Heat a gas grill or a well seasoned cast iron frying pan or griddle. Put in the paneer pieces and cook until they are nicely browned. 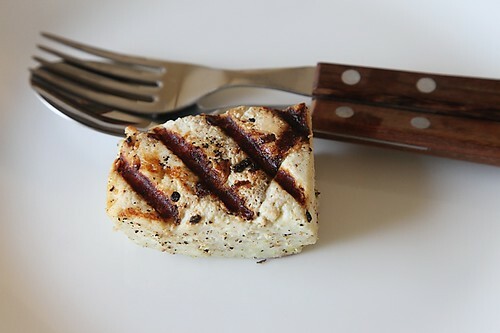 If you use a gas grill you will get those beautiful seared marks on the paneer. Preheat the oven to 180 C/350F. Cut the bell peppers into large chunks. Sprinkle a little with oil and roast them for about 8 to 10 minutes or until done. 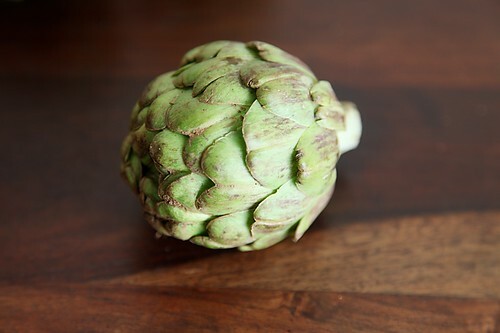 Heat a well seasoned cast iron skillet or grill and roast the artichokes and asparagus separately, using a little olive oil and cook until nicely roasted and you can see it turning a little black in some places. In a small bowl mix all the dressing ingredients together with a whisk or a spoon. In a large bowl assemble all the vegetables, the bell peppers, asparagus and artichokes. Sprinkle the dressing all over and toss to coat. In a medium sized wok or a sauce pan, heat the olive oil. Add in the asafetida and the cherry tomatoes and cook until you see white blisters on the surface of the tomato. Pour in the tomato puree, put in all the spices, the oregano, black pepper and paprika and bring to a boil. Lower the flame to medium low and cook until slightly thickened and the cherry tomatoes begin to lose their shape and begin to disintegrate into the puree, stirring, until thickened and smooth, about 8 to 10 minutes. Stir in the sugar and season with salt. 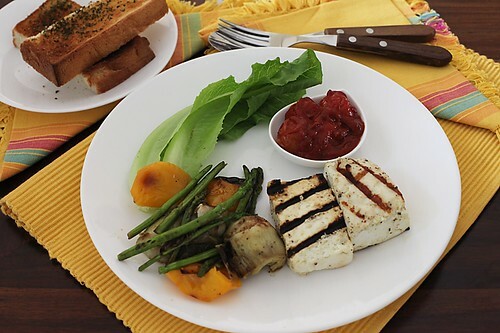 On a large plate, place 2 pieces of the paneer, a portion of the salad, some lettuce on the side and the tomato fondue in a small bowl. Serve accompanied with some herbed and toasted bread. 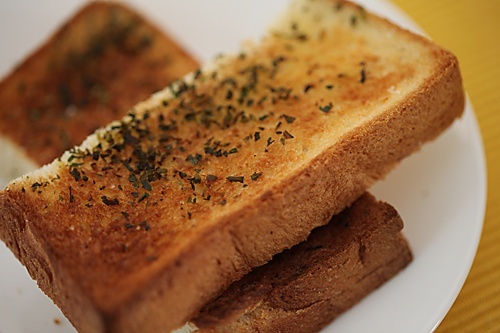 To make the herbed and toasted bread, use store bought or homemade white or wholemeal bread, brush with melted butter, sprinkle with dried herbs of your choice like oregano, parsely or basil and grill in the oven at 180 C/350F for 6 to 7 minutes, until nicely toasted and crisp on the top. If using fresh artichokes you need to prepare them, by peeling the outer leaves and cooking the hearts in lightly salted water. Awesome and beautiful presentation.. Lovely shots dear.. Thanks for sharing !! oh yes this is really up my road. love the freshness of this dish! i think i need to catch the next plane over! Looks lovely, each item on the platter so carefully thought of. This inspire me to try it out. Absolutely love the blend of flavours here A…Asafoetida is a spice that's really close to my heart, and I love the way you've used it here. Beautiful! Meeta: Hop in to the next plane and I'm here to welcome you. Deeba: Asafetida does a great job here which you won't believe unless you actually taste it. It was a pleasure meeting you as well. You have a lovely blog. I will definitely be visiting your space regularly. It looks delicious anu akka! This is a beautiful meal. I love paneer but have never tried it grilled. Gorgeous styling too! The best kind of Comfort Food ever. My kind of dinner!!! I just love the simplicity of it, yet the sophistication. I wish artichokes and asparagus were available in my city. Its a meal that will linger on for a long time to come, may be until the next meal cooked by you. Y.U.M. The fondue was/ is droolicious! hmmmm looks yummy anu…nice marinade of spices in the oil especially hing…your kitcen would have been bursting with the aromas…peppers…grlled panneer…oven toasted bread with spices…awesome clicks as usual!!! Love the healthy spread out there. Like the fresh and delicate veggies in the platter. Lovely clicks.